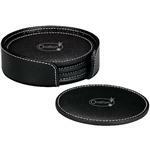 Traverse Custom Leather Coaster Set. This exclusive set of coasters is all that separates the condensation of water vapor droplets plummeting down that frosty glass to your heirloom table. Wick that capillary action. 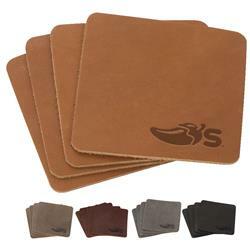 Choose from 5 domestic, USA Made, leather colors and customize to match your company logo to create something truly unique. 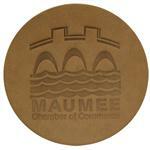 We simply love these coasters - they are high end quality pieces. Production Times Available: Standard 7 to 10-day production time.